So many life firsts in so few months! It is not our first year living here, it is our twentieth. 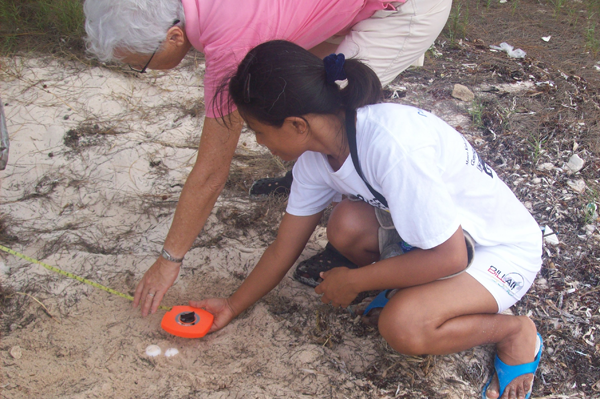 Yet we continue to find new things – and on an island only 14 square miles in area. 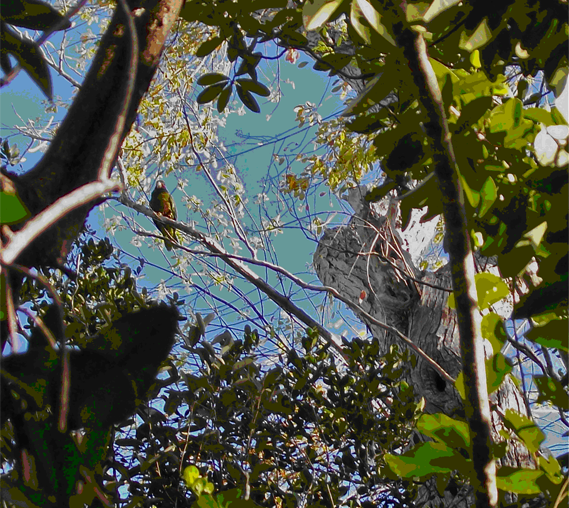 First-time view of a parrot entering her nest! The male stands on the branch deep in the trackless forest, with its tough terrain of pitchfork-pointed limestone. A pretty safe locale, dear Amazona leucocephala hesterna, nothing but a crazy human would find you here, not even a Norway rat. Sinkholes, ancient wash-outs, collapsed streams and rivers, a tangle of trees, vines, cacti and bushes including “Parrot Bill” (Pisonia aculeata) and “Balsam” (Clusia regia and C. alba). Thank you to my friend P. for this life “first”. We spent 11 hours in the steamy forest this day. If my camera lens was a little weak, so was I. Next, it’s on to my first Peperomia plant. It took 20 years and was not for lack of trying. Everywhere I trekked in the forest I looked for a ground cover of succulent, tear-shaped leaves that would mark a member of this group. 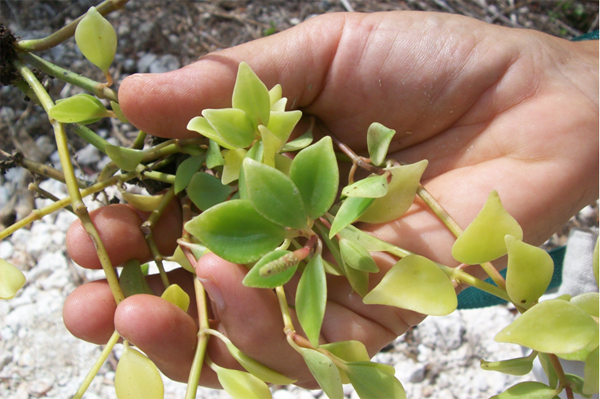 But it’s thanks to friend “I”, here it is, the handsome Peperomia psuedopereskiifolia. We are trying to protect enough forest that it may thrive forever, serving its role in the scheme of things and secondarily, bringing delight to any human that may love the actual jungle. The next phone or text will herald the emergence of the hatchlings. They will scramble out of the nest and down to the sea – yet another first for us! What an island, full of wonder! Almost every outing a “first” happens to one of us. A couple of days ago a friend (T) experienced two first-time phenomena within two minutes. And this brings me to a point. ALL OF THESE BLESSINGS CAME TO US BECAUSE WE WERE OUTDOORS, DOING VOLUNTEER WORK for our nature group. This was her first Portuguese Man-o’-War (pictured) but the other ephemeral scene has no photo to mark it – a Southern Stingray jumping completely out of the water! She only saw it because she was standing facing the lagoon while I photographed the inflated sac of the dangerous jellyfish… and all while we were checking for new turtle nests. May I turn now to “Phasmida”? 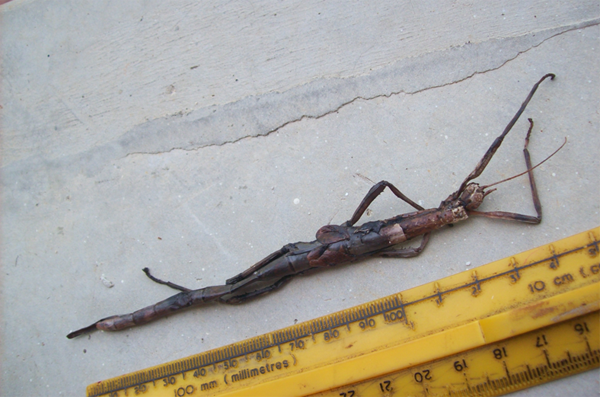 It is the family of Stick Insects and I did not know we had any. Here again we must credit friend “I” who found a roadkill; as well as P who found one on his pant leg as he rested in the deep bush. He shot a mini-movie but I’ll not try to put it here, even though the handsome creature moved in the “wind” as P tried to blow it away. The Black-throated Green Warbler is my most recent “Life Bird”. I have no photo but if you could see the one in my mind you’d be amazed. Such a show as he put on, as if realizing how much delight we took from the view! There were four of us, all with binoculars, all returning from a foray into the bush. Our trip was “over” until we met this rarity, feeding in a Red Birch tree at the turn in the road by the lumberyard. 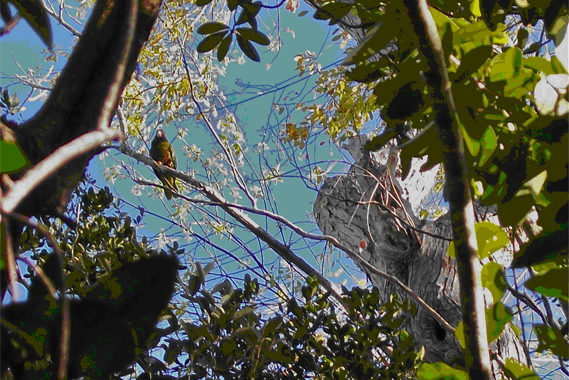 Warbler, we will try to keep our land ready to provide for your needs. Luckily I DO have a photo of Phyllanthus caymanensis, a species of plant I had pondered before but only now came to know. Credit goes to two friends, F who is our most learned citizen, and P with whom I saw the plant in the deep forest. 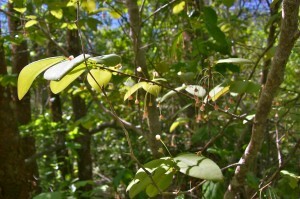 This low shrub, a bejeweled beauty, is endemic to the Cayman Islands. It is rated as vulnerable with as few as 1000 specimens remaining (and that means in the world of course). Forest protection is the only way to protect it and that’s why we were picking our way through the steamy bush that day. We will “stake a claim” figuratively speaking for land to be acquired and set aside for nature for all time. Finally, I want to record the Transit of Venus. I didn’t get a photo, nor will I attach ones kindly sent to me. The Transit of Venus. It was a thing of stunning beauty as well as rarity, and I saw it from our own shore. As it dropped towards the horizon the sun became softened and yellowed by a low mist of clouds, until it looked no brighter than the moon. Unable to capture its image through my lens (directed onto a sheet of stiff, white paper) I did a quick sweep of the round body with my binoculars. BINGO! Let me interrupt my narrative. 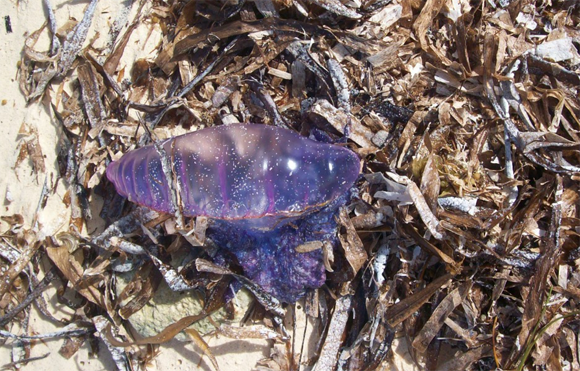 What is specially “Cayman Brac” about this sighting? It is purely a matter of planetary alignment, right? Not so, it must be aligned with the planet the viewer lives on! I had merely to walk the thousand feet to our own ironshore or rocky beach, our little edge of the Caribbean Sea. We’ve done this walk almost daily, often twice a day, for a total of thousands of times. As this particular sunset dropped lower, the great ball dimmed further to allow another binocular sweep, more lingering now, but urgent because the bottom of the sun was entering a cloud bank like a billowy skirt of modesty. There it was, so clear — The Spot, bigger than I had expected. It appeared as a beauty spot, a pretty mole in the very feminine shoulder of our own sun goddess.